Sometimes you hear about people and dogs and are instantly moved by their story with respect and admiration. That was exactly my reaction when I received an email from Bosnia genocide survivor Maja Kazazic telling me about herself and her Great Dane, Rosie. These two specially abled survivors have a special bond. Maja and Rosie’s friendship transcends the human/dog bond. Enter Rosie. When the pup was a few weeks old, her dog mom broke her leg by stepping on it. Unfortunately, even after multiple vet and specialist visits, infection set in and her leg had to be amputated. She ended up at Hanger Clinic to be fit with a prosthetic leg, where she met Maja when they were working on her own prosthetic leg. “In the next few days I adopted her, and we have been inseparable ever since,” Maja says. Today, Rosie and Maja give back by visiting nursing homes and schools. “We try to show others that obstacles only exist in your mind,” Maja says. 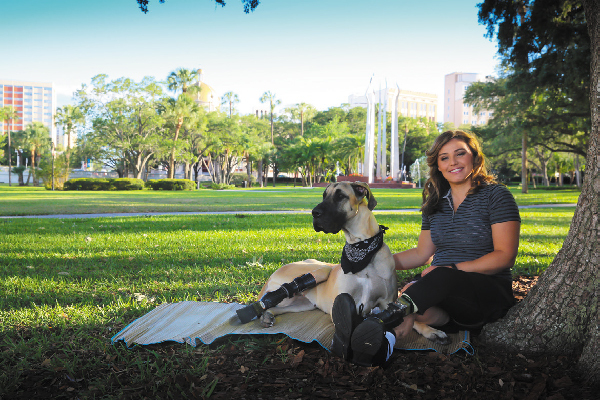 “Knowledge that has been gained from building Rosie’s prosthetics is used to improve care of other injured animals. Our unique friendship transcends the human/dog bond, teaching us as much about us as it does about our furry friends. We spread messages of support, love and hope.” Follow Rosie and Maja on Facebook and Instagram at @majaandrosie. The post The Inspiring Story Behind Maja and Rosie appeared first on Dogster.